Peter was born in Beaumont, Texas. He graduated from the Welding Specialist with Pipefitting program at Tulsa Welding School & Technology Center in Houston on June 8, 2018. Peter graduated high school and went straight to welding school in August 2017 at the age of 16. Thanks for sharing your story, Peter. When did you start welding? I started welding at the house with my dad when I was in middle school. We welded trailers and a couple of barbecue pits. Then when I got to my freshman year, I started taking a welding class. When we moved to Indiana I had to take a break for a year. Then I started back up again when we came back to Texas. Did you always want to go to welding school? I always thought I wanted to go to college, but after a little time in high school I realized that the whole schoolwork thing wasn’t for me. I started looking at college, seeing how much I’d owe when I got out. I thought welding was more personal. I looked into it a lot. I would be in control of what I was doing. I could take pride in what I did. Welding is not an easy thing to do. Not everybody can do it. I enjoyed the fact that the instructors don’t necessarily act like instructors. They are understanding and help you out a lot. They become like friends, really. Here’s an example: I couldn’t find a job while I was at school because companies wanted me to be 18. One of my instructors found me a job. I worked there while I went to school. I lived with my sister in La Porte and drove in from there. How did the instructors compare to high school teachers? They are strict to a point, but they make you live up to a standard. At the same time, they are very understanding. They know that life happens. If you need to stay late or leave early, they will work with you as long as you let them know. You graduated in June. Did you get a job right away? I did not get a job straight after graduation, mostly because of my age. Career Services tried to help me. They were really good about it and called a lot of companies, but everybody wanted me to be 18. Was that because of insurance? Yes, it was a liability insurance thing because of all the equipment we use and work around. Most companies want you to be 18, a legal adult, to put you on their insurance. I did. I work for Civil Mechanical Inc. I’m contracted out at the Formosa plastics plant in Point Comfort, Texas. Right now I’m mostly a fitter and helper. I’m helping welders fit pipe. I’m still learning a lot from the welders I’m working with, though. The reason I’m not welding yet is because they have two people in line in front of me to take a test. 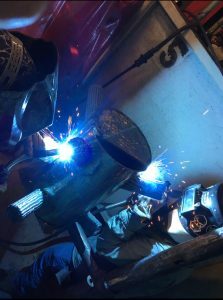 When I have some free time, most of the welding I do is TIG welding on pipe. Through my mom’s boss. They run quality control testing, where they drug test people for plants. She talked to someone for me, and I went in for an interview. They hired me on because I had my TWIC Card and everything else. Plus, my 18th birthday is coming up in late October. You’re still only 17, so what’s your career plan from here? I’m hoping to get sent up for a weld test here soon and I’ll see how it goes. But just last week, I also had someone contact me for a job up in Indiana when I turn 18 in a couple of weeks. It’s at an ethanol plant up there. They want me to be a helper for a month at $21 per hour, plus $85 per diem. I’m considering it, but I don’t know what I’ll do yet. My mom definitely does not want me to go. If I do, she told me I better be home for Thanksgiving and Christmas! I’m saving up money to buy a welding machine for my truck. I’ll give it a couple of years to get some experience under my belt and then go be a rig welder on plants, traveling and making some real money. Explain to people what a rig welder is. A rig welder is a welder with a welding machine in the back of your truck. You get contracted out to go weld at plants and stuff. A lot of people mistake it as just a pipeliner, but that’s not necessarily what a rig welder is. A rig welder welds on plants and pipelines. It depends on where you go and what you do. Did you make some lasting connections at Tulsa Welding School? Yes, I did. We are in a group chat and we talk almost every day. One of my buddies is working in La Porte, and my other three buddies are working out in west Texas right now. I really love trying to explain to people what I do. They look at me, asking what it is. I actually have to show them. I like doing that. I’ve got a couple of friends from Indiana asking me about welding, and how they should get started? I told them they have to start practicing. One of my buddies from up there asked me for a recommendation, and he’s at the TWS Jacksonville campus right now. Another friend messaged me about Tulsa Welding School. I told him to talk to my friend in Jacksonville about it because he wants to go to the Florida campus. It’s definitely worth it. My instructors always used to say, “To get by in this industry, you need connections.” It’s all about the people you know. When you leave this school, you’ll know all the students who are with you. You’ll meet students who are ahead and behind you in school, as well as all the instructors. I know for a fact that if you’re out of work and you message those people, you will find a job.